Competiting • Horsey StuffTravel: Trailer or Lorry? 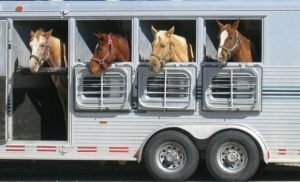 How to travel your horse is a question many horse owners face, however I feel it is much harder for those of us who got our license after 1997. The most obvious travel option is a 3.5T horse box. Sounds great doesn’t it! Unfortunately, if you are under the age of 23 it is virtually impossible for you to hire one as the companies insurance won’t cover under 23s and sometimes not the under 25s. So you might consider buying one instead. But with the change in law, these lorries are now incredibly popular and you are realistically looking at spending £10,000+ for your most basic lorry which doesn’t need loads of work. The other problem you face with these smaller horse boxes is the space inside and the weight limit. Depending on the size and weight of your horse, especially if your taking a friend, you might really be pushing it and be over the weight limit. Which is not only dangerous but could get you a nasty fine if you’re caught! The next choice is then, take your trailer test or your LGV test. Or even your HGV if you want something bigger than 7.5T! Taking your LGV involves a medical and an eye test. These things make it a more expensive process! However, these lorries have a much bigger pay load allowing you to not only take multiple horses without worrying, but you often have space for living too. Which make them perfect for staying away with the horses. They also tend to be a bit cheaper, due to their lower demand. You could pick up a sturdy one for less than £10,000. The trailer test costs roughly £150. However, you will probably need some training too. Many companies offer 2-8 days intensive training. These vary in price, but I think a reasonable, average price for 8-15 hours training is usually around £800. The cost of the test is usually included in this price but not always. So make sure you check what the cost actually includes. A brand new trailer typically costs around the £5,000 mark with second hand typically ranging from £2,000-£3,000. However, in order to safely (and legally) tow your new trailer, the chances are you will also need a new car. Really you want something cheap and economical. But many of these have fairly low payloads. The Rav4, Shogun Pinin and Vitira are nicer small 4x4s which could take 1 horse in a medium sized trailer fairly comfortable. However, you would be close to the towing capacity. The Grand Vitira, Freelander, Discovery, Sorento and various pick up trucks. Are bigger, with higher towing capacities but higher MPG. Nearly all of them are capable of comfortably towing a large trailer and two horses. But some are more expensive to run or more expensive to buy out right. After doing my research, I decided to buy a Kia Sorento. My 2003 plate tows 2.8 tonne and I don’t find it too expensive to run at all. I think the official MPG is 33. But this varies depending on the type of journeys I do. I am now in the process of getting my trailer license so that I can decrease my travel costs and getting Scottie out a lot more! What do you travel your horses with?